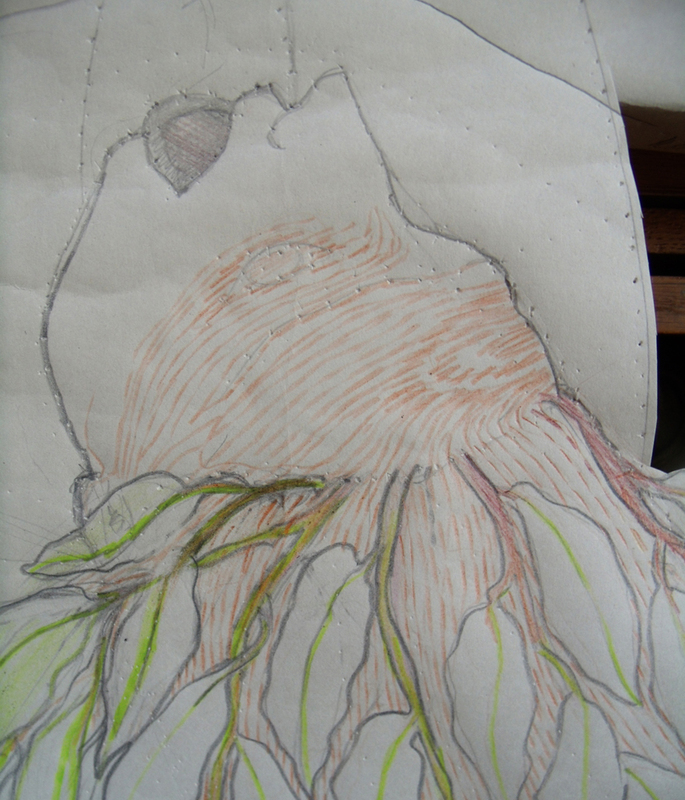 I have often said that drawing is my first language, English my second and Stitching my third, and I can’t now remember a time when I did not draw. 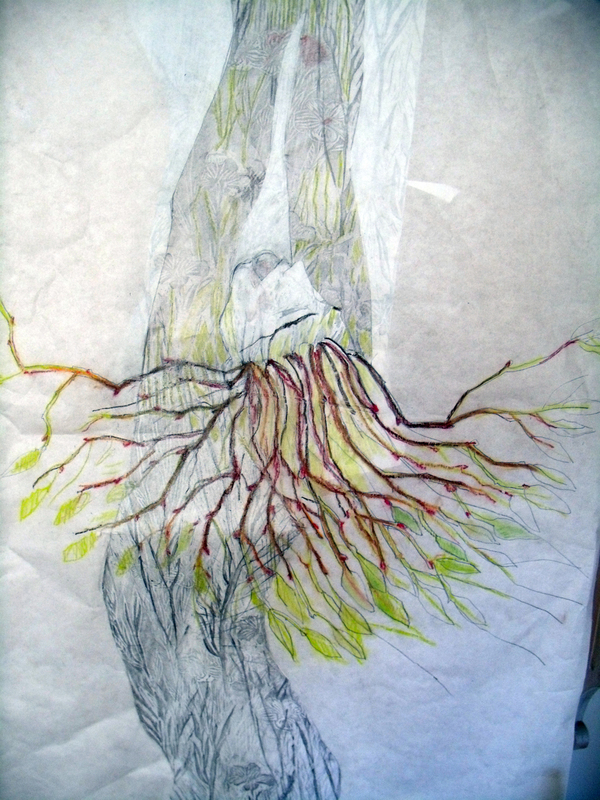 So it is a real pleasure that my latest work (working title – the Daphne Tree) that I am making for an exhibition Pairings, with my partner Rachel Kelly has involved all types of drawing, from scribbled notes on the scrap paper made on trains to laser etched vellum. 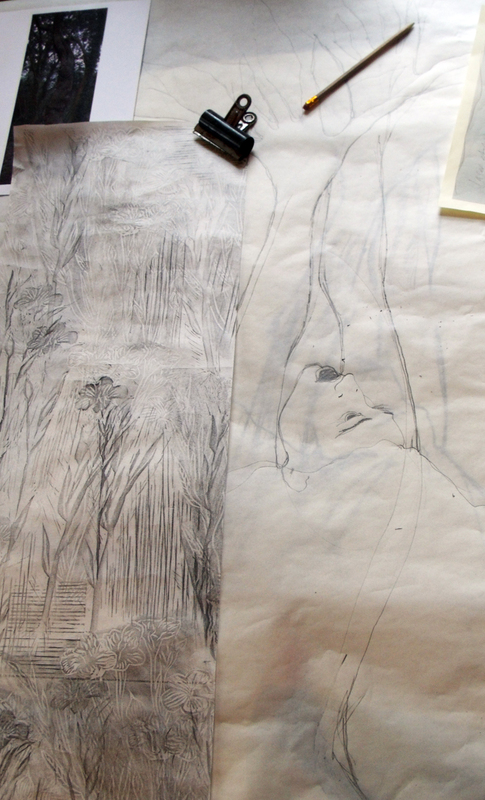 2 sets of drawings on the table ready to be combined into the figure of Daphne. 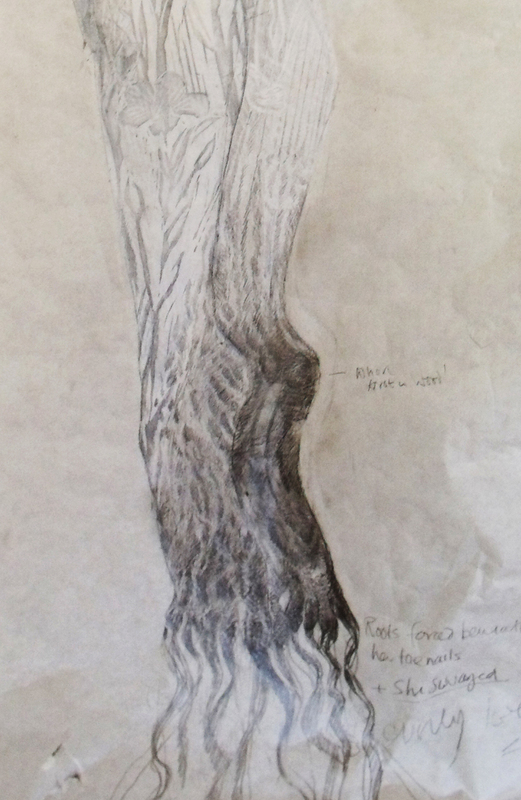 I had to work on her feet, they were supposed to be burrowing into the ground taking root, the drawings look really nasty like she has been burned, but they are starting to look forceful and like they could penetrate the earth. in fact they look like they have been dug out of the earth….But it is the head that has to be looking as if it is in shock at the moment that it is turned into tree bark and the hair to leaves. 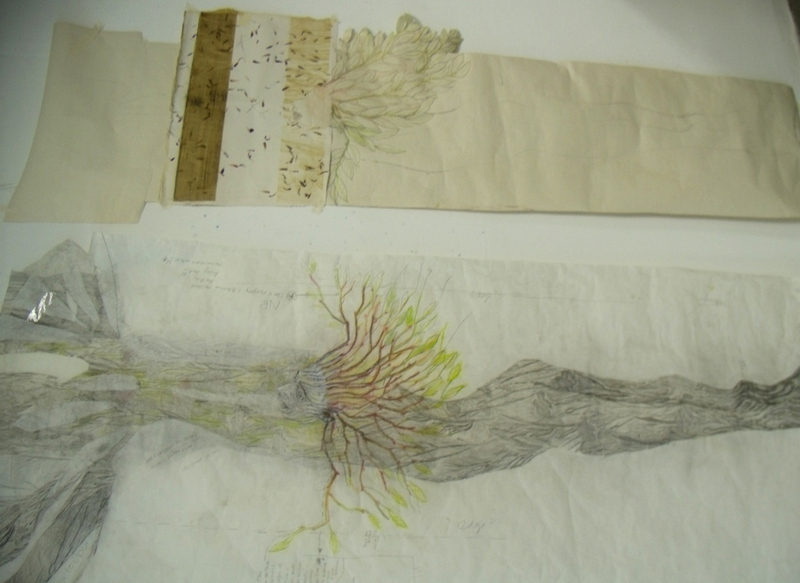 The final drawing for this transition or metamorphosis, has to be exact for it to be then transferred and later translated into other materials and different types of drawing – and this re-drawing with a tracing wheel is just as crucial as all the drawings that have gone before. 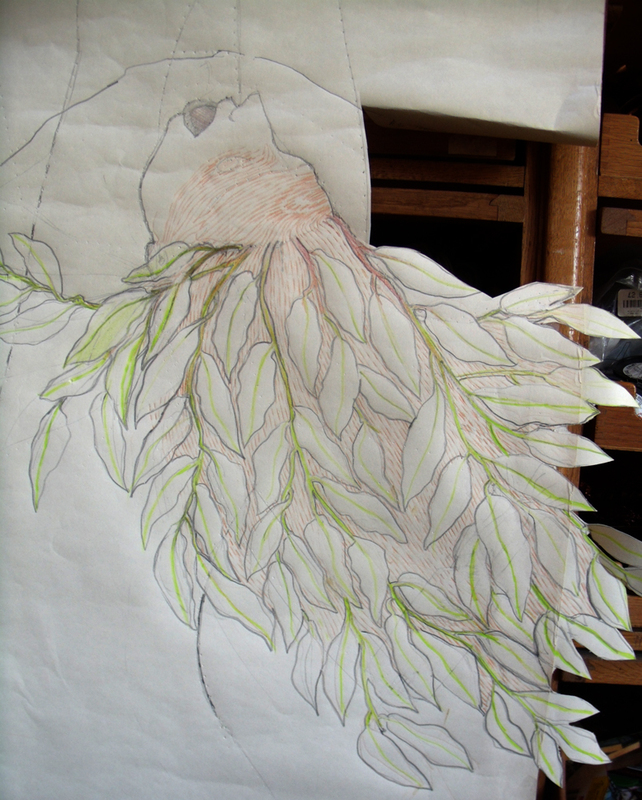 So eventually Rachel and I have met up to develop the drawings, I have taken my large sheet of vellum, that I have been kindly given to work this project with, by Kemin Nahkatarvike oy the Finnish Leather and Fur manufacturing company. 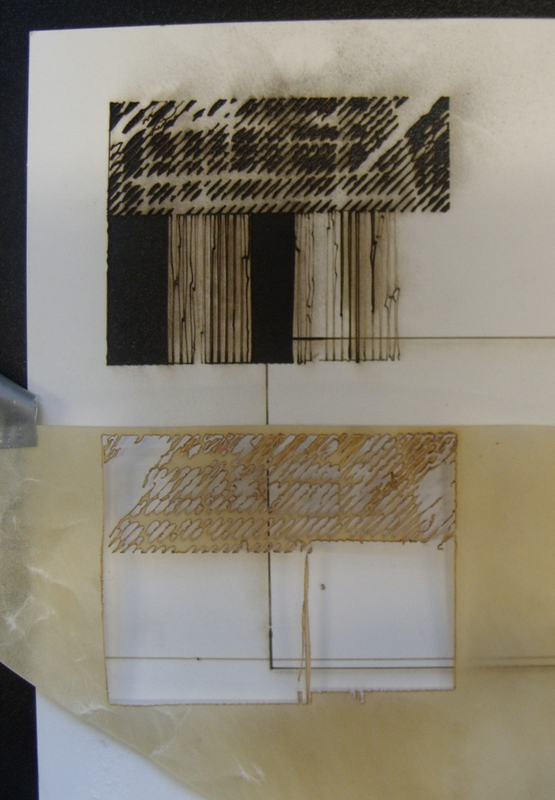 We are now sampling all sorts of other material that we may use in the final piece – we need to sample all the stuff to see how we can laser these drawings onto the various surfaces…but first more drawings are developed by Rachel – on a computer. 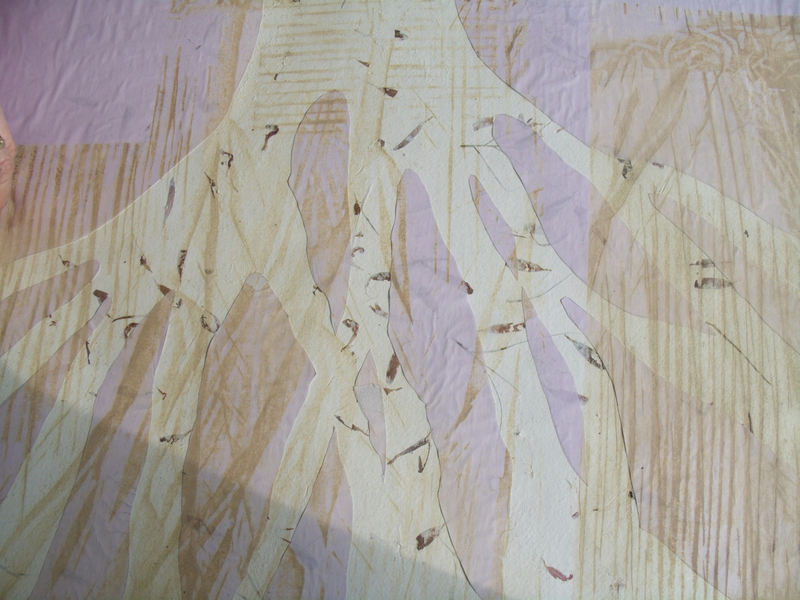 The results were not exactly what we wanted – well not for this project …. 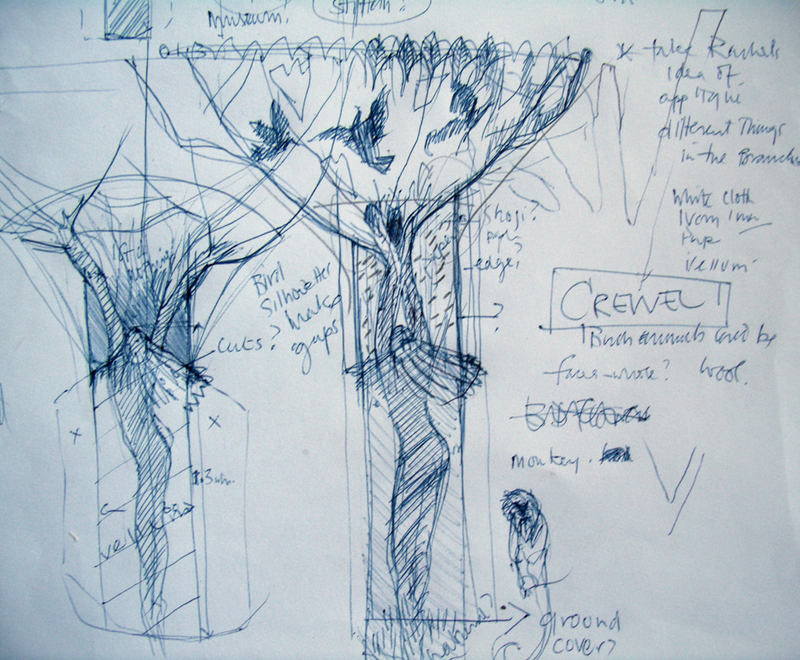 But meanwhile Rachel and I were busy thinking and drawing out the next stage of the work – this is only the trunk of the tree – now we had to imagine the canopy. I had scribbled some ideas down on the train to Manchester, I don’t know what it is about trains but they always make me very imaginative, I get lots of ideas on train journeys. 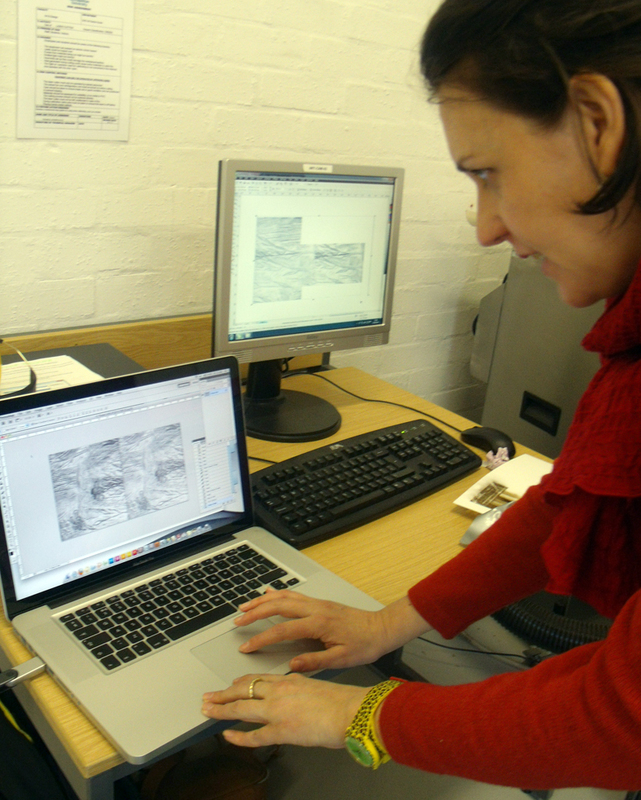 Then while Rachel dealt with the computer drawings – did I mention that she is a technological wonder woman? 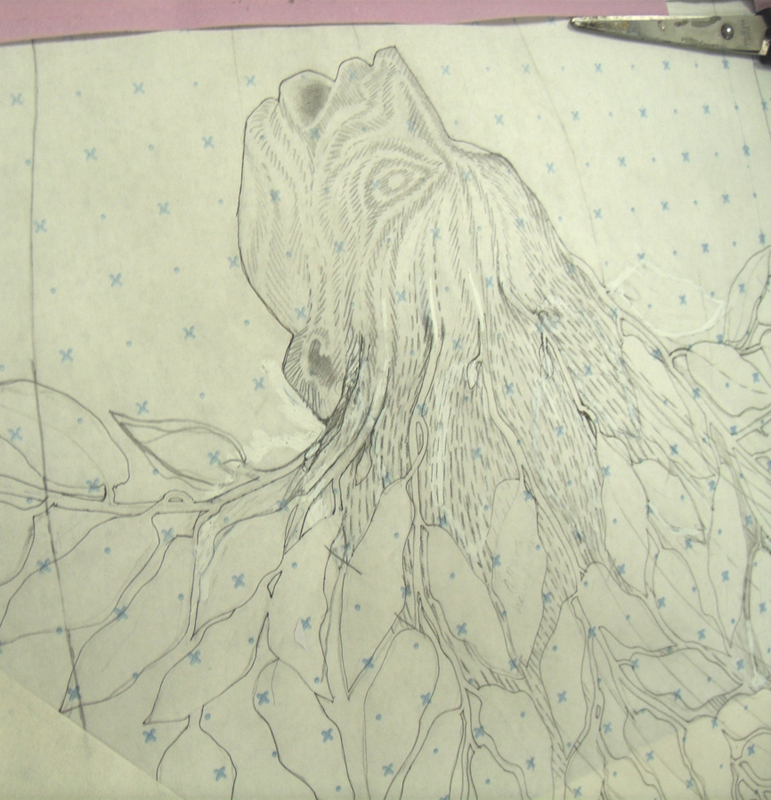 I dealt with the tracings of the original figure. When we met up between tasks or at lunch, we talked of the next stage – how will we develop the canopy? I thought we could applique some printed versions of old flower bird or leaf designs from our separate practices, as used in old American chintz patchworks and quilts. 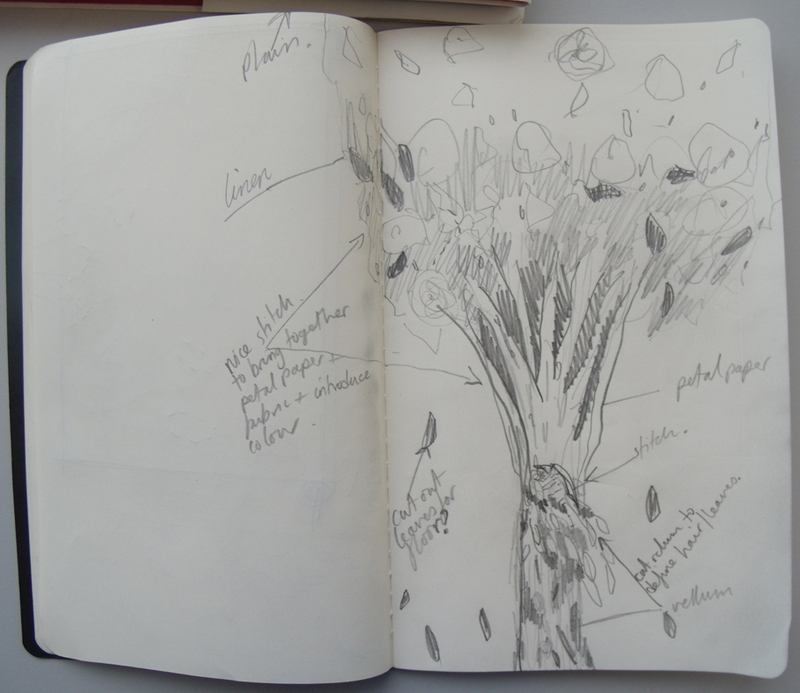 And chintz seems to be where we are going next…but the during her morning train journey into work Rachel drew this( below) in her note book. And now we are at last ready to start to introduce the missing element for us both – colour, but that needs a new set of research drawings…. 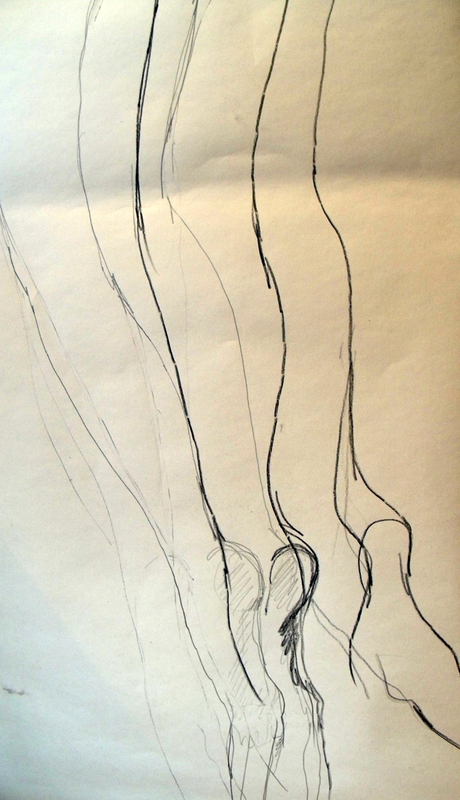 Categories: Drawing, Pairings - Live Project | Permalink. What an amazing process ! 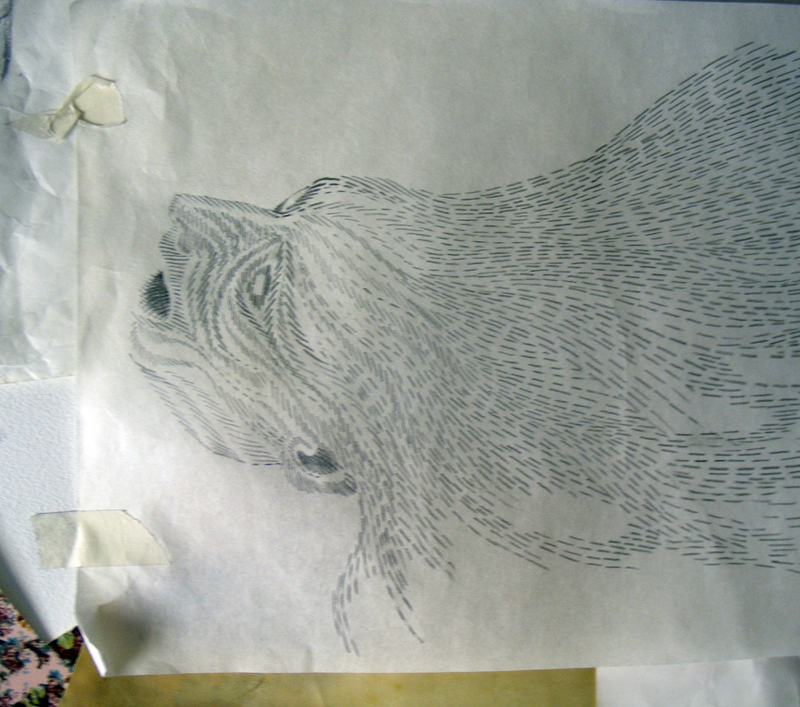 How many of us would even think of the amount of work when the final piece is on exhibit? Thank you for sharing. well I suppose that is the purpose of an experienced maker, to hide the process? Except that so many people just take everything for granted and think that computers, lasers and all the new gizmos do everything – even the thinking. 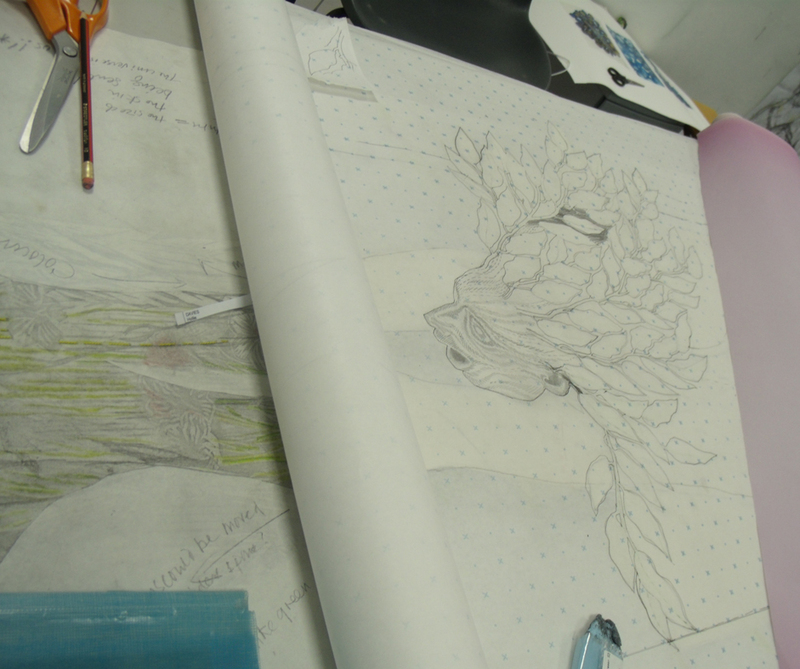 I must admit that there is more hands on work than usual as I am a hand maker working with a techno queen….and we both want to see the evidence of the hand in the finished work, so soon I have to stitch it all together. But when the work is on the wall I am hoping that it will look like it has “been blown together” a favourite saying of one of my technical colleagues to describe a beautifully crafted garment. Thanks for your comment there are more regular updates on the project on the ‘haighandkellypairings’ blog – see side bar if you haven’t already visited it.